At Venue Hotel 新加坡八方酒店, we merge comfort with style. Each room is unique with its own colour theme that is calming and inviting to the eyes. We provide four categories of rooms: Superior Double, Superior Twin, Standard Double, Standard Twin, Premier, Deluxe and Family. All rooms come with complimentary wifi and local calls, a digital safe box, mini-fridge, coffee, mineral water, tea, hairdryer and cable TV. While settling yourself into the calm and cosy settings, the Superior Double gives you a view of the rustic environment enveloping the hotel. Fitted with a queen size pocketed spring mattress that is laid with soft and luxurious bed spread, you will be lulled into relaxation. While settling yourself into the calm and cosy settings, the Superior Twin gives you a view of the rustic environment enveloping the hotel. Fitted with a queen size pocketed spring mattress that is laid with soft and luxurious bed spread, you will be lulled into relaxation. 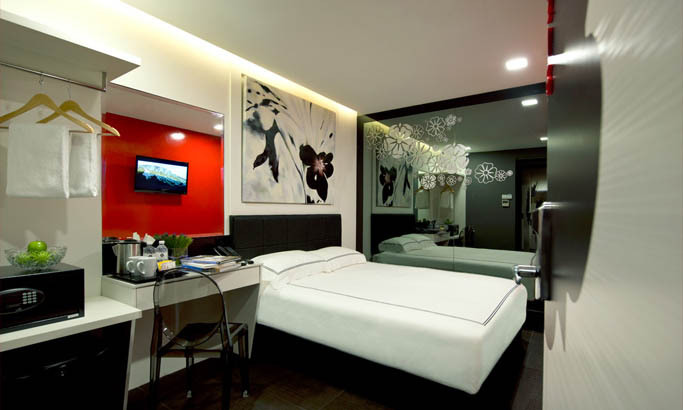 Leave your cares behind in the well-designed space of our standard room. 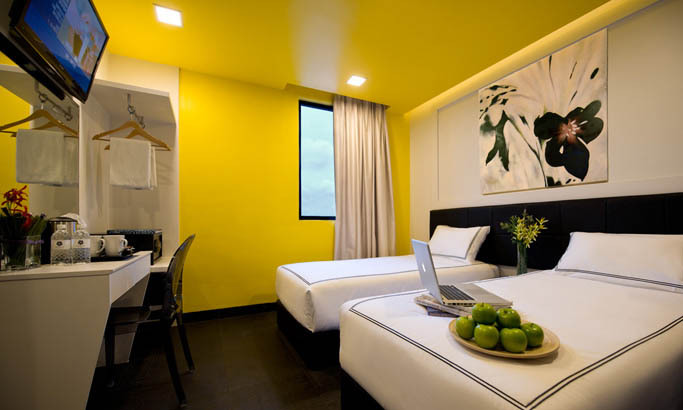 Set against the fresh and crisp colours of white and yellow, the room is fitted with a queen size pocketed spring mattress, laid with luxurious bed spreads to rock you into deep slumber. With two single mattresses laid on a low platform, this standard room exudes a sense of comfort and a feeling of home away from home. 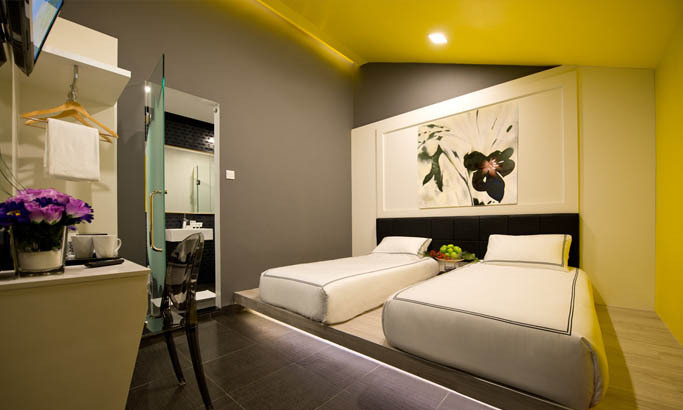 Set against the fresh and crisp colours of white and yellow with warm lighting, it provides the perfect ambience to rest and relax after a day of activities. Offering generous spaces in contrasting hues of grey, orange and white, the premier rooms provide the sensuality of luxury accentuated by modern and quality furnishings. Perfect for that little pampering... and not forgetting an open concept bathtub in the room for life little pleasures!. 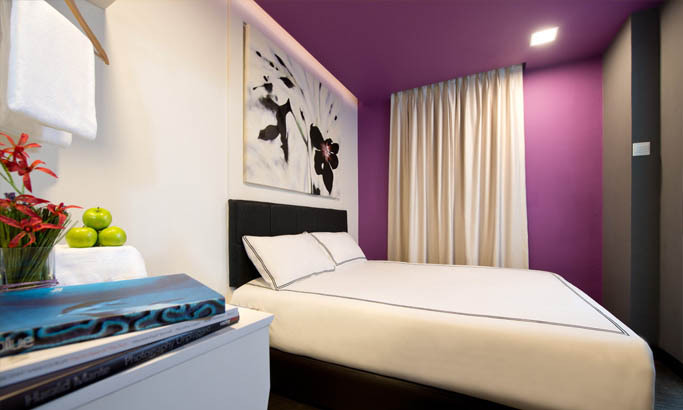 Make yourself comfortable in the lush spaces of our deluxe rooms. A fresh ambience is created with clean, inviting tones of white, grey and orange. Adorned with a full mirrored wall on one side and a plush sofa for lounging, you might just need that extra effort to step outside. Offering generous spaces for families with children, the family room will guarantee a pleasant stay. It is fitted with one queen size bed and a single bed for the young ones to frolic around.